The quiet contemplation of Compline – the final service of the monastic day – provides the framework for this latest disc from Tenebrae. The choir’s full, mixed-voice forces are here distilled down to just five male singers, swelling from unison plainchant to the polyphonic intricacy of Tallis’s Lamentations in a sequence of music and texts for Holy Week. It’s a bold programme – unshowy to the point of wilfulness, taking music so directly, so functionally liturgical and presenting it for aesthetic ends. At one stage during the prayers the voices break from song into speech, muttered invocations reminding us of the greater purpose behind music that can easily become a sort of spiritual muzak. 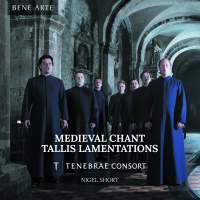 By restoring Tallis’s Lamentations and Sheppard’s In manus tuas to their original context, Tenebrae rediscover their singular beauty and immediacy. The fragility of the single voices (and the darker shades generated by these lower, male-voice keys) summons a world of private, secret devotion, where abstract grief becomes the very real conflict of Catholics under a Protestant monarch. Textures are translucent, each individual voice offering its own personal musical plea. Nigel Short’s singers find an intensity here that’s never overworked. Even the punishingly high tenor moments in the Sheppard don’t obtrude texturally into the disc’s larger musical narrative, one that gains pace from the simple call and response of psalms and prayers into the webbed polyphony of the larger works. This is simplicity at once artful and artless – perfectly poised at the junction of recital and rite.